Which Methodologies Are Useful for Policy-Making? A new article in Foreign Policy magazine discusses the relevance of the academy to policy-making, but I was much more interested in the results of a survey of 234 national security officials that they included as side panels in their article. The details of the survey, which was conducted by Paul C. Avey and Michael C. Desch of the University of Notre Dame, are laid out in their new article in International Studies Quarterly. Here, I report the results of two questions from their survey that I believe will be of particular interest to political methodologists. 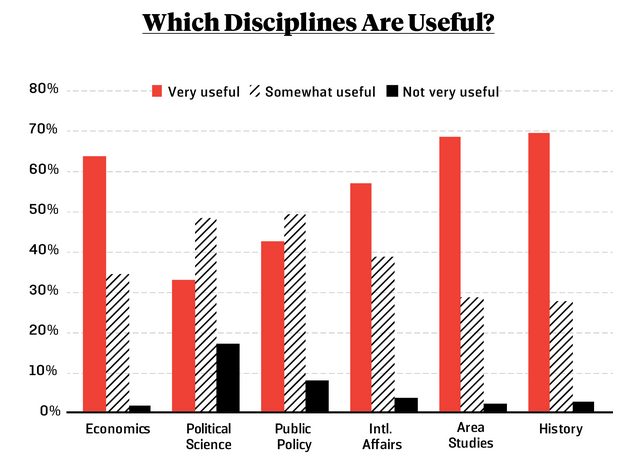 The results indicate that quantitative analysis, formal modeling, and operations research are less-useful to policy makers compared to case studies and area-intensive studies, and that our discipline is generally seen by this audience as the least useful of the social sciences. Q: How useful to policy makers are the following ways of conducting social science research? Q: How useful to policy makers are the arguments and evidence used in the following disciplines? Should we be concerned about this? If not, why not? If so, how should we react? I have my own answers to these questions, but I also think it would be more useful to solicit reactions in the comment section and let the conversation unfold organically. 2 Responses to Which Methodologies Are Useful for Policy-Making? One problem with the results from this survey, particularly the disciplines question, is that the fields tend to overlap. Policy analysis, area studies, and international affairs are often considered part of political science writ large (and sometimes history and economics can be as well). I wonder what the respondents were thinking of as political science, and how that might have changed as a result of splitting those three critical areas out into separate disciplines. The survey questions are interesting because they are about subjective perceptions. The respondents perceive case studies to be useful and quantitative studies to be less useful. This seems consistent with evidence that individuals are more responsive to and have better memory for episodic frames than for systematic (quantitative) evidence. The perception that case studies are important might very well be the result of a vividness bias in the minds of policymakers.